Morocco Camel Trekking & Night in the Desert really is the highlight of any trip to this fascinating North African country. Not only will you experience the immensity of the Sahara, and possibly the most beautiful sunrise in history, but you will also get a taste of the local nomadic culture at the same time. While most travelers, make their Camel trip from Merzouga to visit the Erg Chebbi Dunes, it is also possible to travel further south from M’hamid ,and spend the night at a camp in the Erg Chigaga Dunes. Whichever you choose, the excursions are very well organized, and while the camps are basic, they give you a fantastic taste of the nomadic life in the desert! 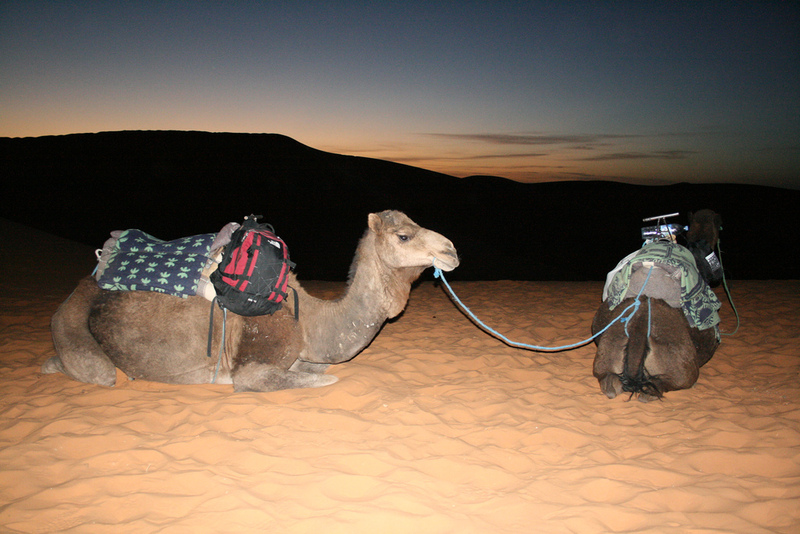 Here we gather information to help you plan your Morocco Camel Trekking & Night in the Desert. The camel trip and the most popular Camel night in Morocco, is a one-night excursion, which starts in the middle of the afternoon and ends in the middle of the next morning. Your personal camel guide will meet you at the traditional Riad / Kasbah hotel in Merzouga or M’hamid, where you spent the previous night (or where you stayed the night before) and introduce you to his camel. After jumping aboard your “Desert ship”, you will leave for the desert camp to spend the night. Most trips will be made late in the afternoon, about 1 hour and a half before sunset, so you will not do a camel trek in the heat of the day and experience more atmospheric lighting. Camel treks are usually only a few kilometers and take about 1 1/2 hours in total. If you leave early in the day, keep in mind that the light is hard and the heat can be intense, and being on the camels for long periods can be a bit uncomfortable. Once you arrive at the camp, your guide will show you his traditional nomadic tent, equipped with all the bedding and plenty of blankets for the cold winter nights. 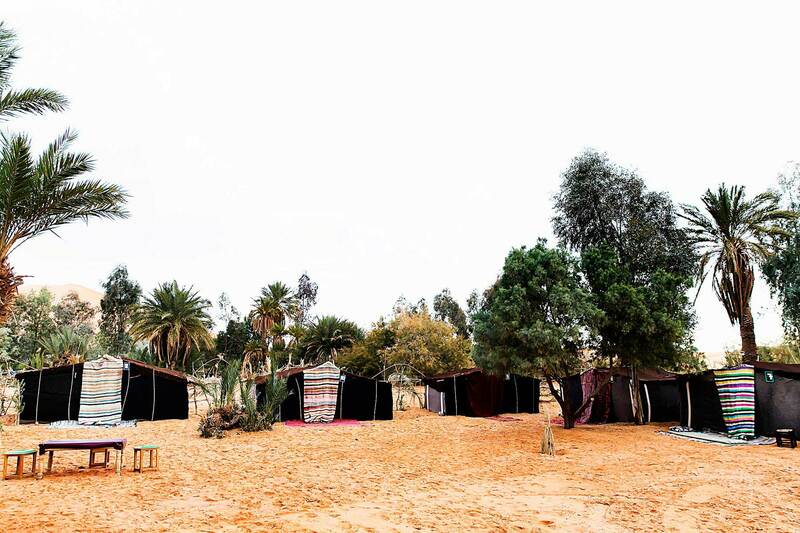 The camps are comfortable but basic, and although there is potable water available for brushing and washing, it is limited in the desert, so use it wisely! Most camps will serve Moroccan mint tea upon arrival and you will have time to walk through the sand dunes while the cook (usually your camel guide) prepares dinner. Dinner is normally a meat-based tagine, rice, fruit, and mint tea, as well as soft drinks that are available for purchase. Some nomad camps have traditional musical instruments that the staff will play (or you can play) and the evening can be as social or as quiet as you want. Do not forget to head out for some incredible stargazing (and perhaps some long exposure night shots), with no light pollution to hinder your view! 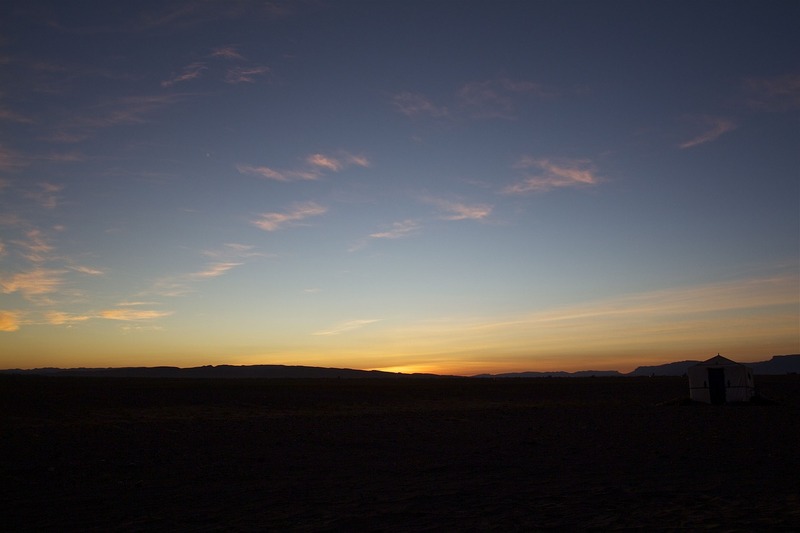 It is a good idea to sleep early, as you will wake up in the pre-dawn hours for a magical sunrise in the Sahara Desert! Your guide will wake you up with enough time to cool off and walk along the nearest sand dune to see the first rays of light on the horizon. After absorbing this surreal experience, you will walk (or slide) back to the camp for a traditional mint tea, before packing your belongings and the camel trip back to the city from which you started. 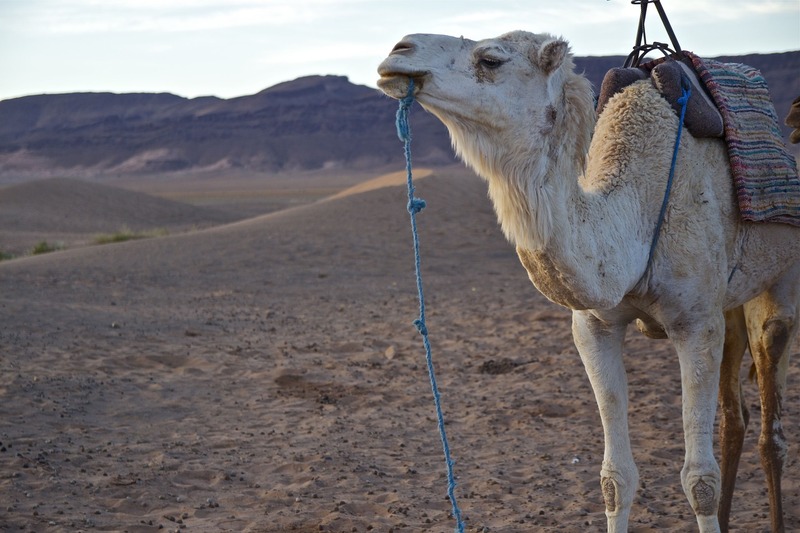 Most Camel rides through Morocco and night excursions in the Desert include a breakfast buffet at the hotel upon your return, and access to hot showers if you wish! If you can schedule two nights of accommodation, consider staying with one of the nomadic Berber families in the desert for one of them. Instead of rushing the experience with just one camel trek in the afternoon and one night in the desert, upon returning at dawn the next day, we recommend that you allow two full days. Who knows when you will return to the Sahara desert again! This gives you time to absorb the experience, chat with your local guide about your traditional lifestyle and capture some spectacular images. You may even have time to do a sand boarding! 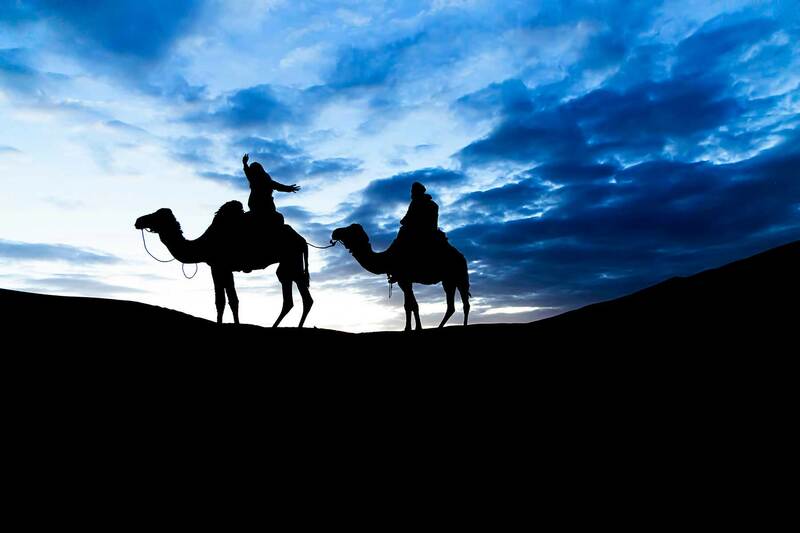 Morocco Camel Trekking & Night in the Desert tour is all part of your Morocco private tour package. But if you are booking locally in Merzouga or M’hamid, request a private tour if possible. This will allow you to go at your pace, stop for photos when you want, and not have other travelers getting in your shots. The exclusivity of just you and your loved ones exploring the camel sand dunes is preferable to a large group of tourists who click (and leave their traces in the perfect pattern of the dunes!). If a private tour is not available, opt for a small group adventure. If you have any further questions about Morocco Camel Trekking & Night in the Desert , please leave us a message here and we’ll get back to you right away!